In the former barracks area Vauban you live on the green outskirts of Freiburg, but at the same time urban and close to the city center. Vauban is a district of short distances. Many facilities such as Grocery stores, drugstore, farmers market, doctors, pharmacy or bike shop are within walking distance. 1 Im Stadtteilzentrum Vauban 037 e.V. According to the traffic concept, the parking spaces in large areas may not be detected on their own property, but lie in two parking garages located on the edge of the district. Over 400 households in Vauban have meanwhile committed themselves to not operate their own car. The tram line 3 Vauban opens since May 2006, the new district with 3 stops. A car-sharing offer in Vauban that complements the good public transport regulations leaves little to be desired in terms of mobility. Thus, the number of cars per 1000 inhabitants in Vauban is about 180. For comparison: the national average is more than 500 cars per 1000 inhabitants. 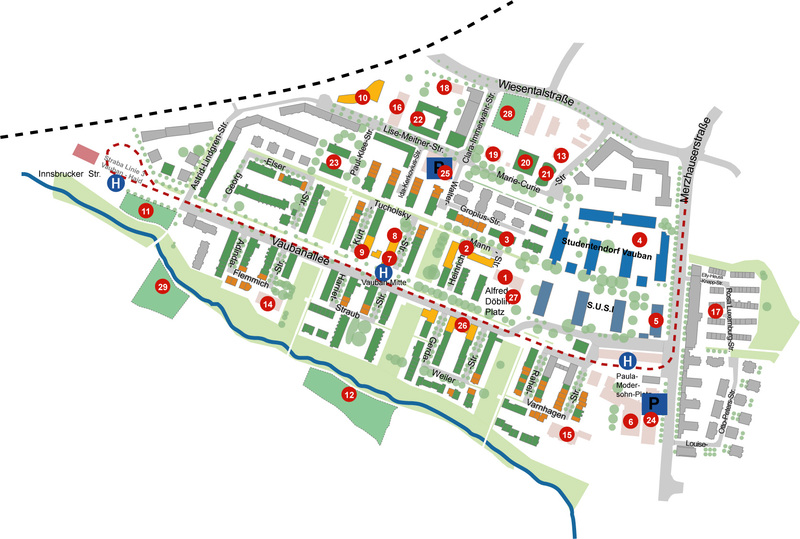 Living in Vauban means living in an urban, lively, car-poor, but child-friendly environment. Accordingly many young families with children moved to Vauban. Meanwhile, the attractiveness of the district is also increasingly recognized by older people who appreciate the proximity to young people. There are many meeting places in the district, the neighborhood shop, the church shop, the marketplace and, above all, probably the nation’s first self-governing district center. It is the seat of the civic association, the churches, a pub and numerous initiatives. Lectures, music, dance and culture as well as private parties take place in the event rooms. The center is located in one of the barracks buildings, which today still remember the history of the district. In a small business park on the northern edge of the district there is also a diverse range of courses, for example. on the topic of health as well as numerous smaller handicraft enterprises (Amöbe, DIVA, Villaban). Numerous green areas (“green clasps”) with different offers (for example, public oven, table tennis, climbing rocks, boules court) run through the district. 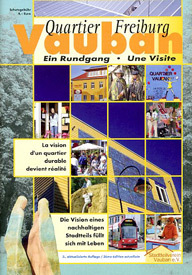 Vauban website der Stadt Freiburg (incl. Luftbilder). “vauban-im-bild” von Erich Lutz – hier gibt es auch einen Stadtplan und eine Anfahrtbeschreibung. Infos zum Film: Wohnen im Vauban – Wie Baugemeinschaften einen Stadtteil der Zukunft gestalten von Hartmut Wagner. Seite von Cartsen Sperling zu Vauban.